A section of the texture I’ve been carving into my crane sculpture. I’ve learned a lot from studying sand patterns at the beach over the past few months. I’m always astounded at how such beautiful formations result from the erosive interactions of just a handful of elements- the density of different sands, slope of the beach grade, the continual play of surf and drying effect of sunshine. 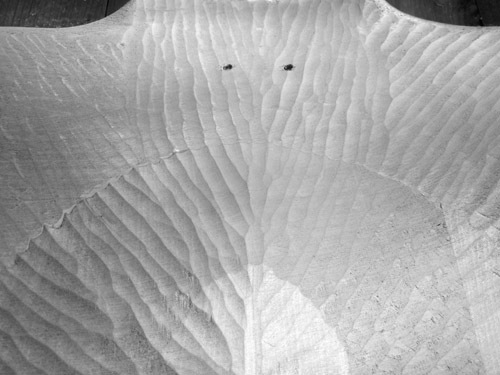 I try to apply these lessons as I texture the fared contours of my wooden crane sculpture for our Tsuru project, cutting parallel channels that follow the arc of the grain over compound curves. 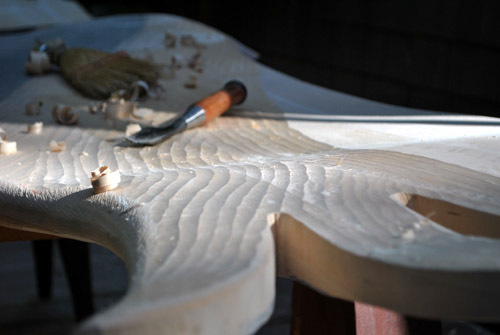 The process takes concentration but is easy going with my very sharp 1.5″ Japanese gouge. When the wooden form is finally cast in bronze, the ridges of my chisel marks will be slightly highlighted with burnishing and their line patterns will recall the feathers of a large soaring bird while remaining true to the inherent tautness of the mother material. Beauty becomes intrinsic to a thing only when its pursuit is incidental to the process. 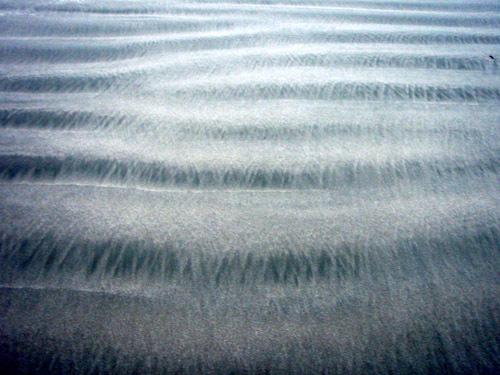 Posted by Scott on February 1st, 2012, at 4:16 pm, and filed under aesthetics, all, daily handwork, Emergence, project dispatches, studio process, tsuru, visceral inquiry.